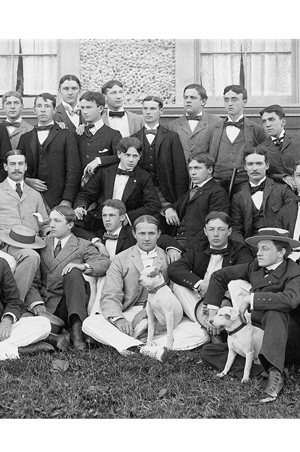 Members of the Princeton Eating Club, Cap and Gown Club, 1893-1894. Courtesy Princeton Universtiy Library. Orange blazer with 1919 Princeton University insignia, 1944. Princeton University band memebers at the Princeton vs. Yale football game, Princeton, New Jersey, November 12, 2011. Photograph by Thomas Synnamon. No university played a greater role in the development of Ivy style during the interwar years than Princeton, which held a sartorial edge over the other Ivies, including Harvard and Yale, its two greatest rivals. This was due to its relatively rural location, the homogeneity of its student population—nearly 85 per cent white, Protestant men, graduates of elite private schools from wealthy families—and its reliance on a unique student-regulated society, typified by its stratified and ostentatious "eating clubs," created in lieu of fraternities. Princeton was the most politically conservative and the most mannered of the Ivy League universities. As G. Bruce Boyer notes, it was, the "best Southern school in the North." Princetonians were the pre-war Ivy style leaders, and they helped move athletic wear from the sporting arenas to the classroom and beyond. Other Ivies followed Princeton’s lead. The rigid expectation that sports clothes be worn only while engaged in athletics began to loosen during the 1920s. Princetonians were also credited with introducing the modern sports jacket. They appropriated the Norfolk hunting jacket of the mid-19th century, pared down its construction, and began wearing it with non-matching trousers. 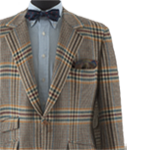 Brooks Brothers would eventually name it the "odd jacket." One of the most interesting of the clothing phenomena to come out of Princeton was the "infamous" beer suit. Debuting in 1912, beer suits were repurposed work wear worn to protect good clothes from spilled beer. They could not be washed and were to be worn only by seniors, a strictly enforced rule in Princeton’s student-driven hierarchy. Beer suits were worn by alumni to reunions for 25 years after graduation; only after that could alumni don reunion blazers. Ornamented with a range of imagery inspired by politics, culture, or student life, the beer suit never caught on at other Ivy League schools.